Debbie Murphy of The Royal Oak, Reading Road, Yateley and her friends have pledged to raise money for a life changing operation for brave little Yateley boy, Charlie Adams (age 5), who lives with Cerebral Palsy. Debbie and her team, Caroline Hinton and Joanna Worboys also from Yateley are holding a fundraising event at The Royal Oak on Friday 15 April 2011 from 7pm. There will be live music, a raffle, auction and much more! 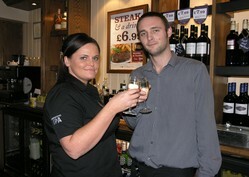 Our photo showslocal barmaid Debbie raising a glass to success with her colleague Charlie Graham. 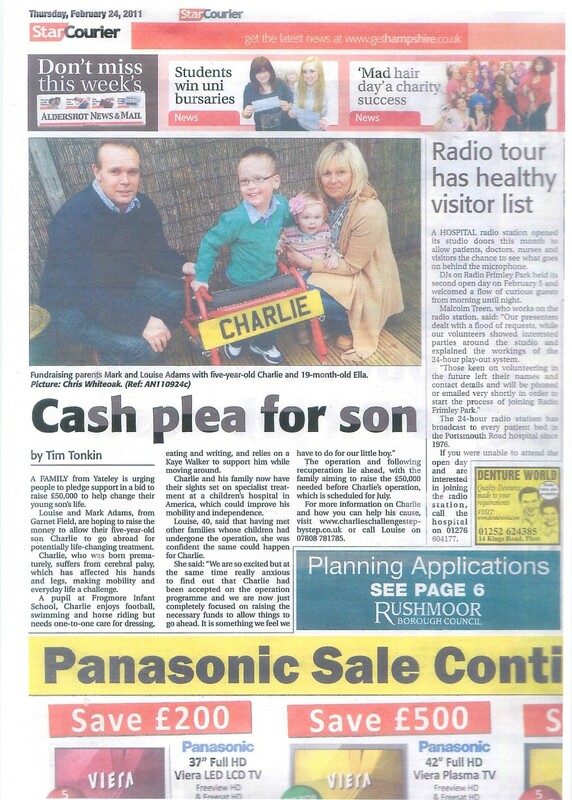 If anybody has anything they would like to donate to Charlie’s Challenge please contact Caroline@dshpr.co.uk or join Charlies Challenge Step By Step Party on facebook, just type Charlies Challenge Step By Step Party into the facebook search. For further information, please contact Caroline Hinton at DSH Public Relations and Marketing on 01252 408820, email , www.dshpr.co.uk.